THE EPIOCULAR PREDICTION MODEL: IN VIVO VERSUS IN VITRO DRAIZE SCORES FOR CONSUMER PRODUCTS. EpiOcularTM (OCL-200) is an organotypic tissue model of the human corneal epithelium (HCE) cultured from normal human keratinocytes using serum free medium. H & E stained histological cross-sections show that the structure of EpiOcular closely parallels that of the HCE. Previously, the prediction equation for eye irritation, Draize score (MMAS) = -4.74 + 101.7/ (ET-50)^0.5, was developed by correlating the in vitro ET-50 with Draize rabbit eye scores for 19 water-soluble chemicals from the ECETOC database and 41 cosmetic or personal care products/ingredients (ET-50 refers to the time of exposure which reduces the tissue viability to 50%, as determined by the MTT assay, in minutes). The current study reports in vitro results for an additional 24 consumer products, including shampoos, hand soaps, laundry detergents, dishwashing liquids, and skin lotions. A plot of the in vivo and calculated in vitro Draize scores, when correlated to the line In Vivo Draize (MMAS) = In Vitro Calculated Draize, gave the correlation coefficient, r = 0.85; when a single outlier was excluded, r = 0.93. The useful range of the EpiOcular test was evaluated by testing surfactants at concentrations at which the Draize test is insensitive (MMAS scores less than 2.0). EpiOcular was able to distinguish between surfactants at concentrations 3-10 fold below this point. 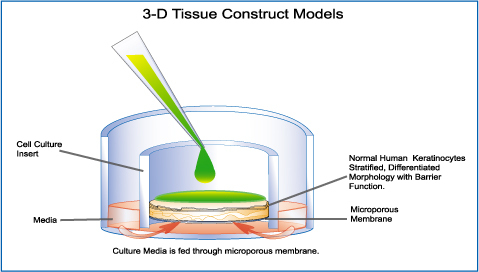 Thus, the EpiOcular tissue model appears to be a sensitive, accurate in vitro means of predicting in vivo ocular irritancy for a range of consumer products and raw materials.